This plant is known locally as the Sumatran Giant Lily (Crinum amabile). I've also seen it referred to as the Giant Spider Lily in some sources. 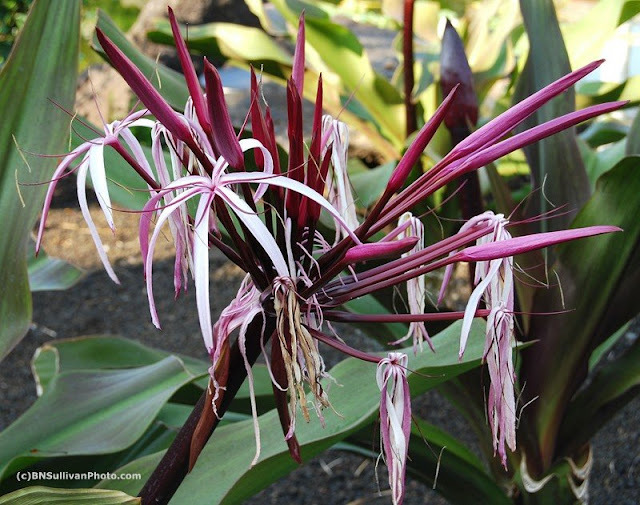 According to Angela Kay Kepler's book Hawai'i's Floral Splendor [Honolulu: Mutual Publishing, 1997], this plant has been cultivated in Hawaii for more than a century. For those of us with gardens located close to the ocean, the Sumatran Giant Lily has the advantage of being salt tolerant. The blossoms smell good, too! The plant is native to the Indonesia island of Sumatra, hence the name. This certainly is different. It does resemble a spider, and I love the color. Hi B & G - There are similar plants that bear flowers in other colors as well. Love the color. I really wish they would come out with scratch and sniff screens. I'd love to be able to smell this. Hi 2Sweet - I just LOVE your idea for a 'scratch and sniff' screen. Just imagine what possibilities that could open up!